One is a calm looking man in a brown suit. He makes his way down the main street and walks directly to Cedar Valley Curios & Oldwares, sitting down on the footpath, where he leans silently against the big glass window for hours. Holly Throsby is a songwriter, musician and novelist from Sydney, Australia. She has released four critically acclaimed solo albums, a collection of original children's songs, and an album as part of the band, Seeker Lover Keeper. 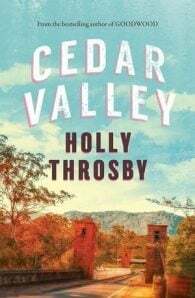 Goodwood is Holly's debut novel.